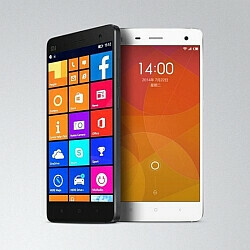 Back in March, we told you that Microsoft was testing a Windows 10 Mobile ROM for the Xiaomi Mi 4. Today, the ROM has been released by Microsoft. Even though we've seen the Mi 4 running on the platform as early as last April, Xiaomi has released new photos on its Weibo page, showing its current flagship phone powered by Microsoft's mobile operating system. At the time that we first heard about Microsoft's plan, it appeared that Windows 10 Mobile ROMs would be made available for a number of different Android phones. As of now, it will be offered for the Xiaomi Mi 4, the Xiaomi Mi Note series, and the Xiaomi Mi Pad 2 tablet. Once installed, the ROM overrides Android and turns the handset into a native Windows 10 Mobile device. Microsoft expects to benefit from users providing feedback so that it can improve the platform, and from those signing up for Microsoft's services. It also will add to its revenue from Mi 4 users buying apps from the Windows Store after installing the ROM. Release it for Redmi-1S, It has a huge user base..
Dang it! Well done Xiaomi. They release a alternate official OS for the new MiPad 2 while the owners of the previous gen are still waiting for the kernel sources. They are very well aware of the fact that the MIUI tablet rom is unusable and multitasking is dreadful. Awesome! I'd love to see this for my One M8, too. One question, Alan: What is the difference between a WP installation and a ROM? I mean, apart from the installation process. 1520, better screen, better camera, probably better battery. IMO that is. Got 2 for under 250 each. A phone with similar hardware to the mi-4 should be able to use this rom. Does it support Mi3 as well? well the new f**k s**t is this.The cheap chinese will get win 10 before premium lumia's.Great job microsoft.Keep it up.Your flagship is also not running the proper win 10 version but chinese will. Mine is actually ahead of the 'proper' windows version. My 1520 has had win10 support since early this year. Using it as a daily driver since day one of preview launch. I have no fear with my backups in place. It'll certainly not have continuum as MS would like to keep this feature exclusive to its flagships. Seems like a step down to me if someone ends up flashing it. It seems to me MS is trying to pull a oneplus here, a marketing stunt, trying to become relevant among devs again because xiaomi has one of the most active online community but they are failing here too because mi4 is not as popular as mi 4i or redmi 1s. No, continuum just requires new enough hardware. I believe Acer announced/released a phone that supports continuum. Microsoft isn't keeping anything but the Pureview cameras exclusive to their phones. As of yet is what I meant friend. Surely they're not gonna take away the best feature in the OS. It is hardware not software restricted. Continuum is literally running two full screens at once, and two app platforms at once, sorry but the 801 just isn't going to cut it. Duplicate posts again and again. Something wrong with my network or phonearena? Damnnnn xiaomi. Nothing but wins!